Whether you are missing just one, a couple, or even all of your teeth, they can truly be a daily burden. People with missing teeth are often very self-conscious about them, and they can often prevent someone from enjoying their favorite foods. What some may not know, however, is that people with missing teeth are much more likely to develop gum disease and bite alignment problems, both of which can lead to even more tooth loss! To avoid this litany of issues, the best thing to do is always replace missing teeth, and the best way to do this, by far, is with dental implants. Dental implants are the most state-of-the-art tooth replacement solution available today, and if you’re ready to say “goodbye” to the gaps in your smile, our dentist, Dr. James R. Nelson and our team can provide them for you. 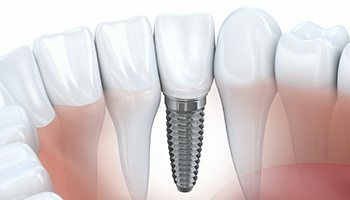 A dental implant is actually a small titanium post that is placed directly into the jawbone in order to restore the root structure of a lost tooth. This can then be used to support a variety of restorations that can replace everything from a single tooth to an entire smile. Since these implants are anchored directly into the jawbone, they provide these new teeth with unrivaled stability. Plus, they also support the jaw from within just like natural teeth, which helps a patient maintain their face’s shape and fullness. Dental implants are truly special because they are the only treatment that can do this! How Do Dental Implants Actually Replace Teeth? When you choose to get dental implants, the process will start with a minor surgery in which the posts will be placed into your jaw. To ensure the success of this procedure, it will be performed by a local specialist of Dr. Nelson’s choosing. Once you have completely healed (which can take 3-6 months depending on your situation), you’ll return to Nelson Dental Care to have your new teeth placed. For a single missing tooth, Dr. Nelson will restore it using something called an implant-retained crown. 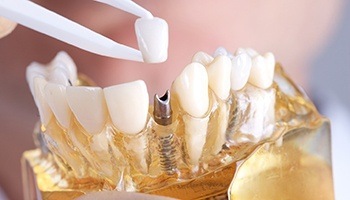 First, he’ll attach a metal connector to the implant post called an abutment that will show above your gum line and resemble the shape and size of your tooth. To complete the process, he’ll place an all-porcelain crown over it to make it look completely natural. Dental porcelain is an amazing material because it can replicate a tooth’s shape, size, color, strength, and even feel! In the case of a few missing teeth in a row, Dr. Nelson can use two implant-retained crowns to support a bridge. He’ll simply place two crowns on either side of the gap in your smile, and these will be attached to prosthetic teeth that fill the space. Dental implants can also be used to support a partial or full denture. Implant-retained dentures are anchored directly into the jawbone just like natural teeth, giving them a stability that traditional dentures simply can’t match. They’ll also maintain their fit for much longer than normal dentures, and they even give a patient a bite force more similar to natural teeth, allowing them to eat a wider variety of foods with confidence. With the proper maintenance, dental implants have been shown to last for 30 years or more, making them the most long-term solution for missing teeth currently available. If you’re ready to have your complete smile back, please contact our office today for a consultation. We are based in Metairie, so we’re happy to serve patients in Bonnabel Place as well as Lakeview and West End, New Orleans.